Since beginning this conservation journey the most amazing people keep entering my life. I am continually awed and inspired by their passion and dedication to shaping this world into a better place for all of us. I’m thankful to call them my friends. On today’s show I get to chat to one of those friends, Georgie Dolphin. We met over a shared loved of wildlife conservation and children’s books, so as you can imagine, the attraction was instant. Georgie’s a rare breed. A truly kind, generous ... See More and lovely soul. Georgie works for Humane Society International (HSI). An amazing organisation that work to create a humane and sustainable world for all animals, including people. Through education, advocacy and empowerment. We talk quite a bit about the important work that HSI undertake, particularly the role Georgie plays. 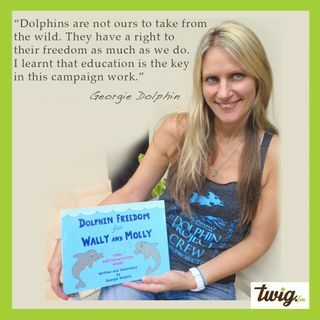 Her children’s book, ‘Dolphin Freedom For Wally And Molly’, seeks to education children about where dolphins truly belong, in the wild. A sensitive and gentle story, that ends with fun dolphin facts and games. Also in our chat . . .
What turned a 13 year old Georgie into an animal advocate. What came first the desire to save dolphins or to create children’s books. Georgie’s book making process using just her computer, how she printed it and what her goal is for publishing the book. The public response to her children’s book. Getting her children’s book into Japan and China. How she copes with copes what she’s exposed to on a daily basis through her job. How much trouble the world’s donkeys are in at the hands of Chinese medicine, something I never knew about it. About dolphin advocate Ric O’Barry and the film, The Cove, about the annual wild dolphin capture in Taiji Japan. Such an important film for dolphin conservation. The Montessori School child-centred educational approach. The importance of social media in spreading the conservation message, particularly in countries that have been traditionally hard to penetrate. I hope you enjoy this really educational episode of Wilderkids. If our eyes our opened we can action serious world change just by simply deciding where we put our money.